Here are links to some pictures and a short video from Alan Youngblood / Ocala Star-Banner. - For two days in March, I was in vintage double hose heaven. I made four 30 minute dives on Saturday the 19th and five 30 minute dives on Sunday the 20th. I used the same twin 38 tanks for every dive but alternated my double hose regulators between a blue VCR2 Voit 50 Fathom, a chrome VCR2 Voit 50 Fathom, and a green hose VR1 Voit Lung... All of my Voit Sea Hunt regulator babies got into Silver Springs and Sea Hunt Forever! - I quickly discovered the best use of my cascade refill tanks was to do two dives per refill... And my tanks were dead empty each time I finished a second dive... Had to pull the reserve lever after three different Dives! - I met and dove with many of the friends I've made in the internet vintage double hose community. 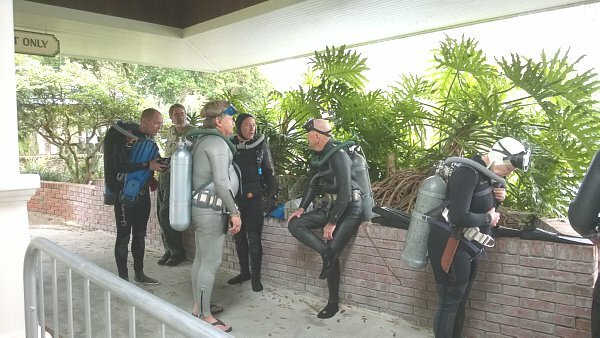 Some of us were newbies (like me, Rob, George, Brian, and I think one other diver). Others were with the vintage movement since the beginning. Tom Madere, Herman, Bryan Pennington, Rob Studnicka, Barb, Luis and Christine Heros, Bill and Francie Tucker, Allan Klauda, Jerry Lang, JOe Musial, Bruce, Terry, Gary Reece, Mark... I know I'm forgetting somebody. 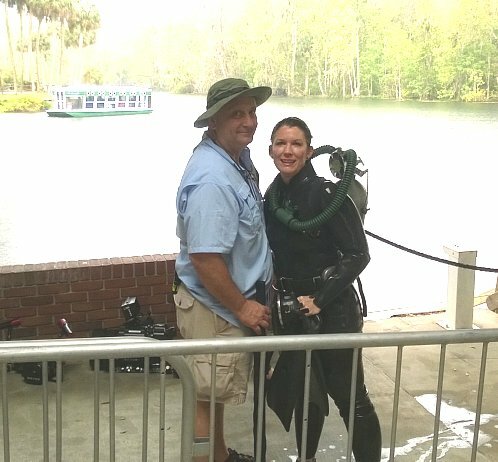 - Credit for a Job well done: Bryan Pennington (pictured above with Eva) accomplished nothing short of a miracle in pulling together all of the people, sponsors, park officials, divers, and conditions necessary to make Sea Hunt Forever a reality. Vintage Double Hose, BG Capital, the Florida Springs Fest, and the Silver Springs Park management were all gracious hosts and made us all feel super-welcome. I was and AM deeply honored to have been invited. - Rubbing Shoulders with Celebrities: Pictured above from left to right are: A professional underwater photographer, a park ranger, Gary Reece, Jonathon Bird (of the TV Show) Tom Madere, and Christine Heros. - Photo by Gene Page... Compliments to the Prop Makers: Allan Klauda brought rubber knives, Spear guns that looked real but only fired CO2 bubbles, fake blood, and a fake anaconda (my favorite was wrestling the anaconda). Joe Musial made and brought underwater flares. Jerry Lang brought his fully restored and functional Voit Porta Sub. Others brought their own props, Rob and Luis had what looked like real KABAR fighting knives that were made out of plastic. 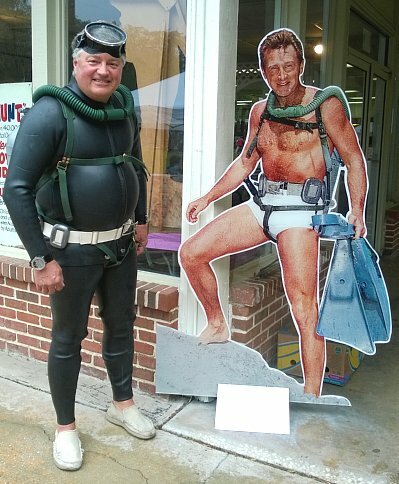 - Alec Pierce brought his extensive collection of Sea Hunt TV Show Memorabilia (including the full size Mike Nelson cutout at the top of this post). Alec and Rob Studnicka (The Scuba Museum) set it all up for the public to see. Above Alec is pictured in the blue shirt with Mike Nelson Lookalike contestants: Eben (me), Allan Klauda, and Rob. Brian is pictured suiting up at the far right. (Sea Hunt Jerry won the prize). 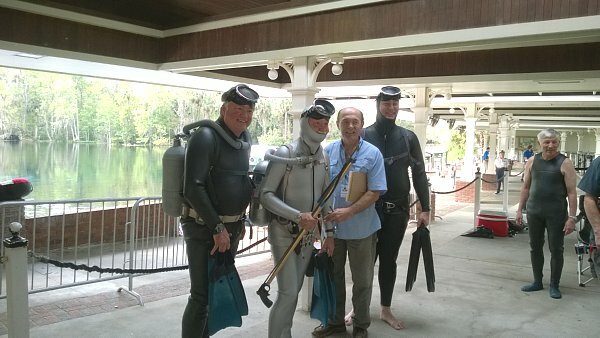 - T-Shirts by The Scuba Museum: Rob Studnick had some beautiful T-Shirts for sale at his booth as guests entered the Silver Springs park. 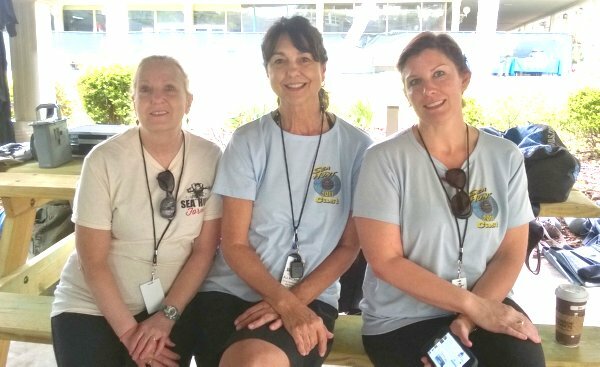 Pictured above are Sea Hunt Forever divers Christine, Barb, and Eva modeling Shirts from Sea Hunt Forever as well as Sea Hunt 2011. You can still order one of these shirts from The Scuba Museum. - These are only a few of the thoughts and comments I have... I didn't know where to start so I just started blurting them out. There are a heck of a lot more photos and videos than I've posted here. Follow Luis' links above to find most of them. I haven't even gone through my GoPro videos yet. I'll post more later. I had been searching the internet looking for information, maybe I will keep and service my Conshelf 20 Supreme, when I came upon this board. Spotted Sea Hunt and figured I would share a little bit of Sea Hunt info . The TV series was a commercial business so there were certain regulations in it's filming. In 1958-61 all filming fell under union and California regulations. Lloyd Bridges may have been a diver but he was not a licensed skipper. So the studio hired my Dad William "Bill" McNames as the skipper for the dive boat Bridges allegedly skippered. It was a flying bridge so when Bridges was at one station in view, my Dad would be in the other station not in view. One day the camera man caught just my Dad's foot in the shot. Well by Union rules if a person or their body part is caught on camera, they had to be paid minimum union rate for that whole day. 300 dollars , YEA . Some place I have a pic of my Dad in his skipper getup. Dan, that is a great story. I knew that Lloyd Bridgs was taught diving during the show, but I had no idea that he was not skippering his boat. Thanks for posting that information. If you find that picture of your Dad, please do post it. And the video is done! Thank you Jonathan! That was really special. Jonathan Bird did a great job showing the gear, the techniques and the fun this event entailed. 'Only wish I was there. Looking at the credits, it appears that you were not alone there. Thank you for posting this, and maybe you could also post it in the Vintage Media area, as we don't want to loose this video. - Wow! I finally made it to Prime Time TV! I'm just waiting now for the movie studios to start calling to offer starring roles! Ha! Ha! I'm in two knife fights... The guy with the gray round bottom Twin 38s is me. First fight I die too easy. Second one is me and Rob doing the Sea Hunt death spiral... We knew that one was TV worthy when we started spiraling! Rob killed me REAL GOOD on that one! 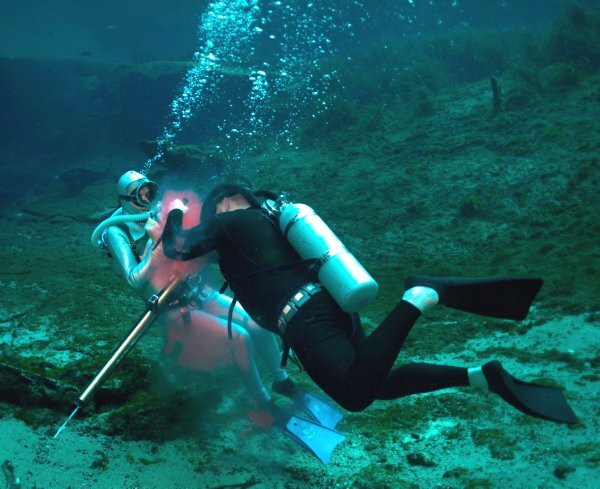 - Thank you Jonathon Bird for doing such a nice story on our Sea Hunt Forever show! 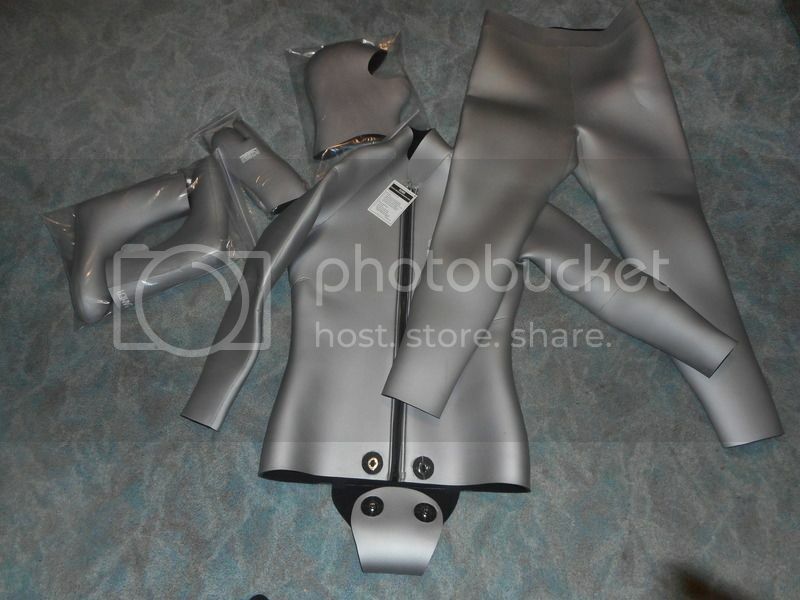 Silver slick skin suits - do tell, who still makes those? Its a size XXL and it cost over $800 with hood, boots, and gloves.